Hey People! I bring good tidings of hot tea to you. Sorry it’s coming late, I’ve been super busy and tired from all the fashion week turn ups and parties, but I’ve finally recovered and ready to spill the tea. 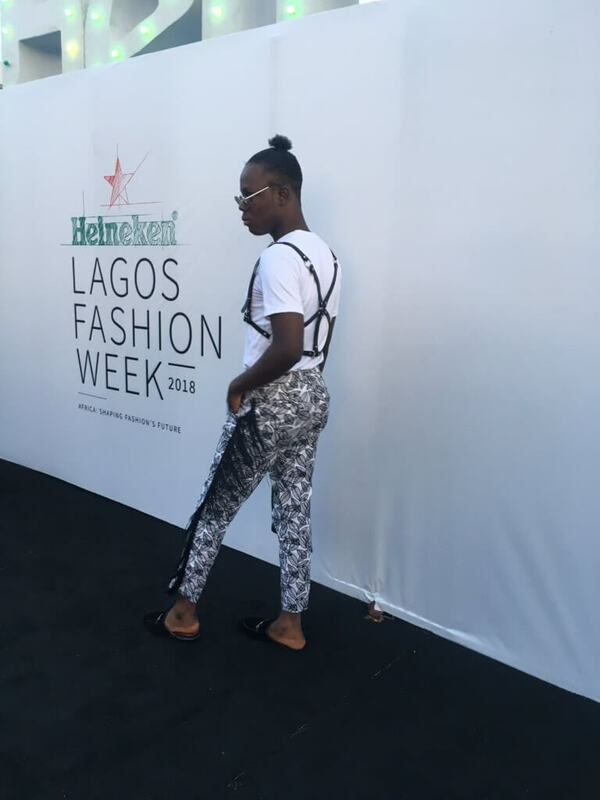 I got to the street style around 6 PM on Day 4, looking like a baddie in a custom “Fola Francis” shirt, and an “Oboy Lagos” fringe pants and mules, paired with a harness from “Crystal Claire”. And to top it all, I was rocking a man bun, okurrr! The shows started super early and on schedule, which we’re really grateful for. 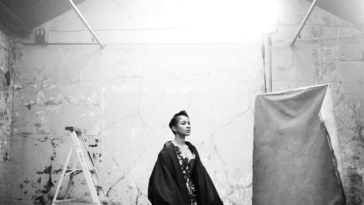 All the designers that showed on the finale were amaze-balls, every single one of them. Some even gave us nip slips, we’re equally grateful to them. Kudos to them all. 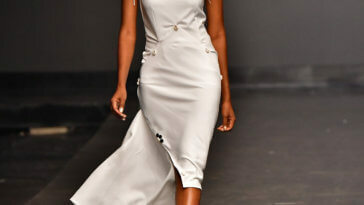 The following designers that swept me off my feet are, Deola Sagoe, Tokyo James, Mai Atafo and Orange culture. 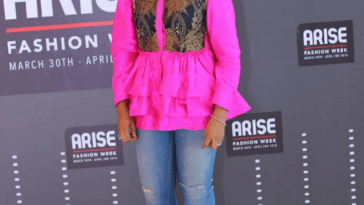 Deola Sagoe manipulated the Aso-Oke fabric like never seen before, and it was everything. The silhouettes, the sheer illumination, structure, peacock details, the fringes, the lace fusion, OMG the collection was divine. 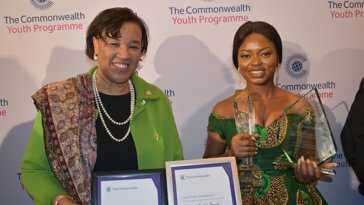 Deola is nobody’s mate in this Aso-Oke business. 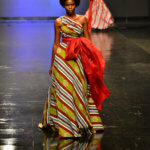 Lot of designers jumped on the Aso-Oke trend, the likes of Emmy Kasbit, XII, Orange culture, and Elle Kuame. 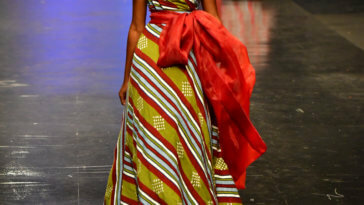 Another designer that wowed me was Mai Atafo. 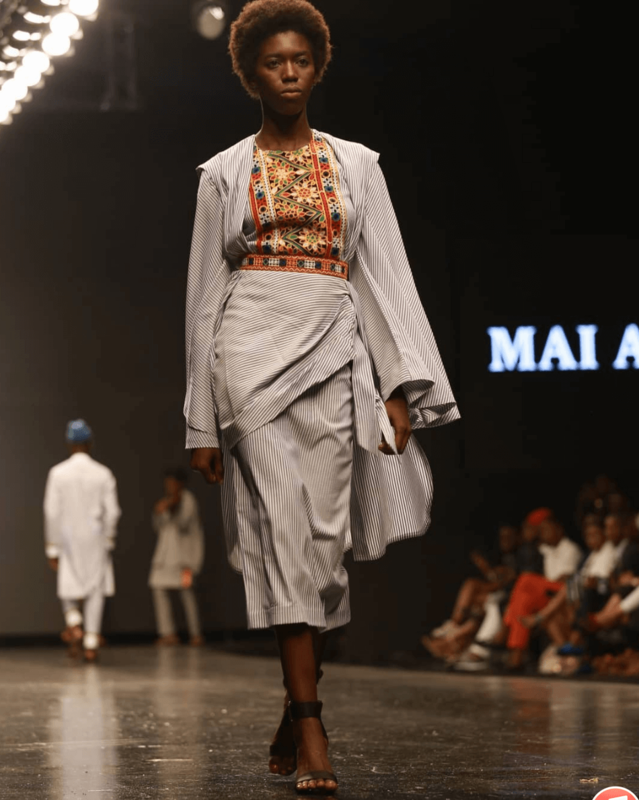 I’ve always liked Mai Atafo’s pieces because of how quintessential they are, but I’ve always also said his pieces doesn’t excite me because, they’re always too safe in my opinion. It was as if he was listening, because he went all out with this new collection, it was a complete shocker. His show started with a violin player coming on stage serenading the atmosphere with lovely covers as the models walked. OH MY GOSH! 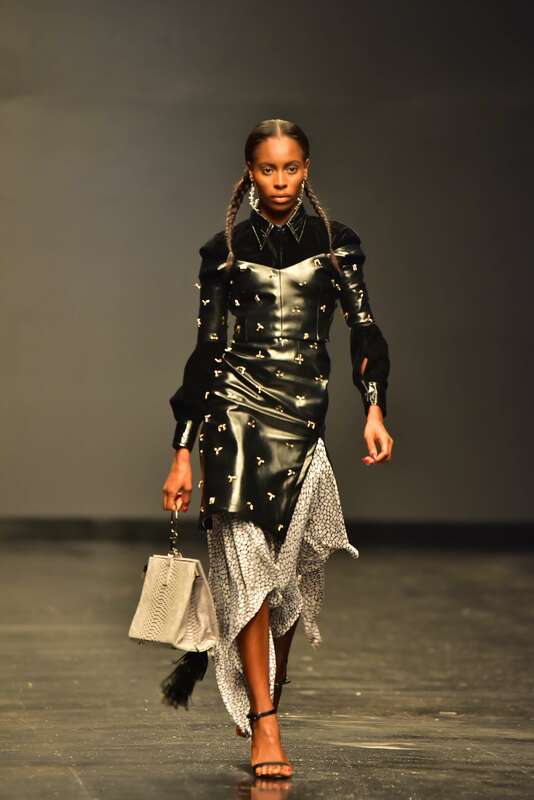 I loved every single piece, I loved the white and grey pieces, I loved the stripe ones, loved the orange veil some on the models had on, I loved the waist belt with attached pockets, loved the 3D Tee shirts, I loved the urban military vibe the collection gave out. The show was unexpected. Mai was smart for making Julez co-creative director of the collection, thanks to that everyone can’t stop talking about his show. Y’all already know I always have my ultimate fave, and this one goes to “Tokyo James”. Tokyo James pieces are the highest high fashioned pieces that ever fashioned. (Lmao if that’s even a thing). Writing about it right now excites me so much. We saw the reptile skin in all its gloriousness. The collection was super luxurious, I loved the intricate jackets and studded trench, loved the metallic pieces, the black latex pieces, and I loved the leather jacket with lavender fur on the shoulders and collar too. Don’t even get me started on the bags, I wanted them all. There was one like an entire back pack as a fanny, I gagged. 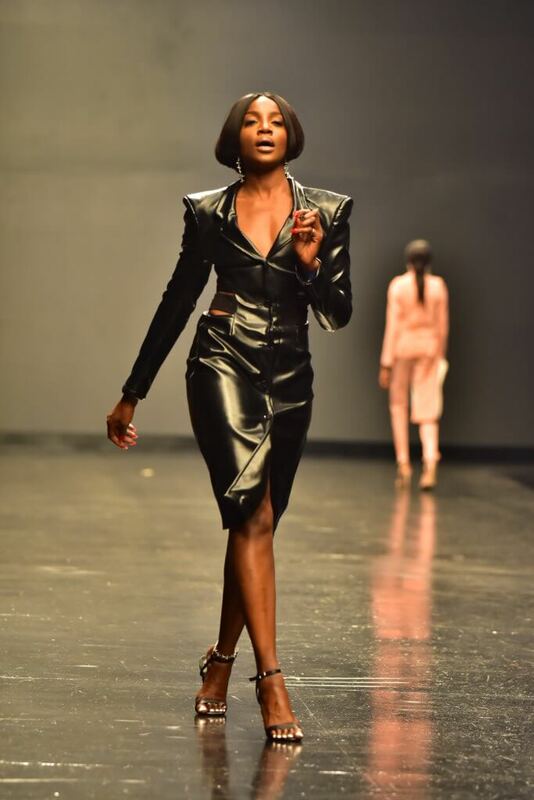 Then we thought we’ve seen it all, until the female models started strutting in with massive furry pillow bags, and slaying our lives in more reptile skins, and then Seyi Shay pulled up to close his show in a long black leather peacoat. His show was so surreal. 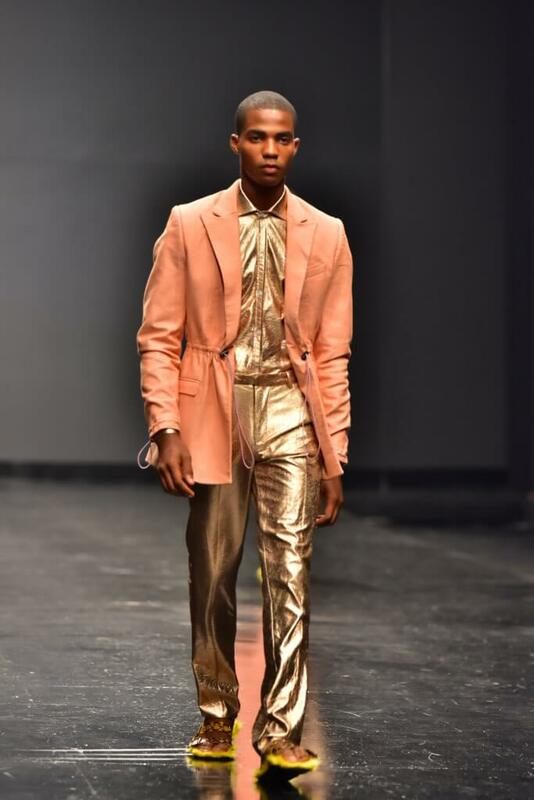 The last designer I’m writing about and closing designer for Lagos Fashion week 2018 is Orange culture. First of all Bayo never disappoints so I knew he would put up a show and he did, and it was epic. Its safe to say everyone loved the models formation and styling. I loved the sinister face paints, and the farmer’s cap with attached braids. I loved how androgynous his pieces were, I loved that it was celebrating the diversity in the world, and also breaking the norm one fashion piece at a time. 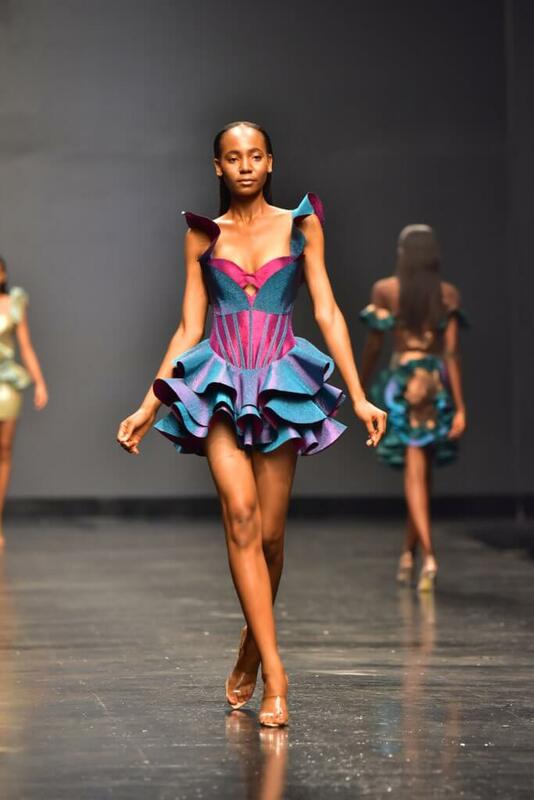 That’s all the tea I got from the finale of Lagos Fashion Week 2018. Till next time when I bring you some brewed tea. Muah! 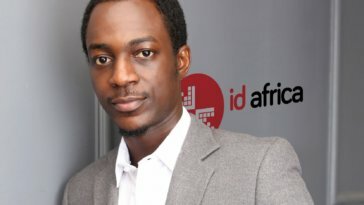 Read Fola’s Day 2 and Day 3 reviews.